Whether it’s war and poverty on the evening news or bullying in our own schools, we all wish we could protect children from life’s harsh realities. But at the same time, we want them to grow up to be well-informed, open-minded adults with an understanding of the world outside their front doors. No doubt they’ll pick up some of this information from the media, the Internet, and their friends at school, but wouldn’t it be better if we introduced them to the wider world in a supportive environment, to avoid the spread of misinformation and promote understanding? Granfield stresses the importance of having a grown-up share her books with children, as the stories inevitably lead to questions. These difficult topics do need an adult who is sort of a go-between, who selects the material and then presents it, she says. The Road to Afghanistan doesn’t shy away from the realities of war “ Granfield mentions sleeping in trenches with rats, killing enemy soldiers, and suffering horrific injuries “ but she balances those descriptions with relatable stories of hope and family bonds, and tries to convey soldiers’ motivations without introducing personal bias. Another way of attracting young readers to difficult subjects is with a charismatic young protagonist who stands up to an enemy. Such is the case with When I Was Eight (Annick Press), a picture book by Christy Jordan-Fenton and Margaret Pokiak-Fenton about an Inuit girl who faces humiliation at the hands of a cruel nun at a residential school. With the Idle No More protest movement having become a prominent Canadian news story, this aspect of our country’s history “ the abuse suffered by native children at residential schools “ is arguably more relevant than ever to today’s kids. In Button’s Willow Finds a Way (the follow-­up to 2010’s Willow’s Whispers, both from Kids Can Press), the shy protagonist and her friends learn the power of the phrase You can’t come to my birthday party! when a girl at school lords her upcoming celebration over her classmates, leaving some feeling left out. It’s a form of social bullying, and for someone as timid as Willow, it takes a lot of courage to overcome. 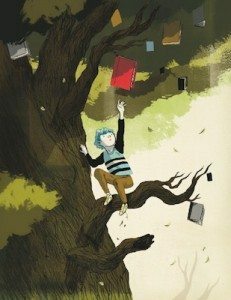 With books that tackle challenging subjects, the hope is that young readers will actually enjoy reading them “ that they will be good, not just good for you. Ideally, the educational element is blended into a story that is compelling, relatable, and boosted by illustrations “ kind of like sneaking bits of cauliflower into your kid’s mashed potatoes.